60-inch blue console offers lots of storage with three drawers and cabinets beneath featuring tempered glass insets behind an X motif. Jofran blends the timeless style of Craftsman furniture with modern functionality to create this media console. Measuring 60 inches wide, this piece easily functions as a TV stand, the cabinets beneath featuring cable management points for satellite boxes, game consoles and more. The tempered glass door panels behind a classic X motif create an appealing space to display fine dishes and curios, allowing this console to double as a dining sideboard or family room storage unit. 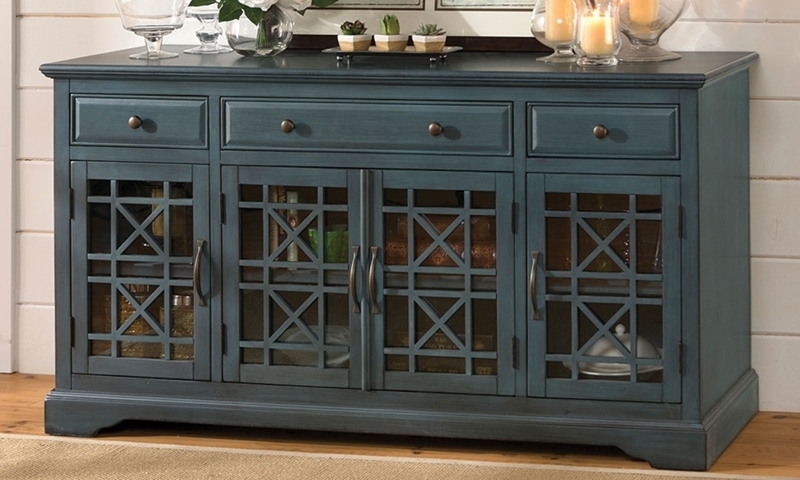 Its slightly distressed antique blue finish offers a timeworn look and pleasing pop of color to any room. 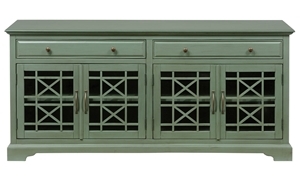 Media console in a green finish measures 60 inches wide, featuring three drawers and glass paneled cabinets showcasing a classic X motif.